The engagement level the influencer has with their readers (total comments, likes, views, and shares a post gets). Since engagement is such an important part of the decision-making process when employing influencers, we wanted to take a deeper look into which networks generate the most engagement for their posts. Tomoson isolated thousands of influencers from our database, each with a total reach of 10,000 or more. We used these influencers to determine the average reach for each social network as well as the average level of engagement per post created on these networks. Comparing a networks average reach and average engagement reveals each network’s engagement ratio. An influencer’s reach can sound impressive, but the size of an individual’s reach is much easier to fake or manipulate. This is why we always show average engagement for every influencer on Tomoson. Engagement Ratio shows the relationship between total reach and engagement. The goal is to find higher percentages that show a bigger chunk of an influencer’s following interacts with their posts. After running the numbers we had some obvious findings and some surprises. In a nutshell, if you’re looking for an engaging influencer you’ll typically find them on Youtube and Instagram. This was expected and we’ve seen this trend for some time now, but the surprise was the Engagement Ratio associated with Facebook Personal Profiles (aka Micro-Influencers). These users were getting over 5% of their followers to pay attention to their posts and comment. Keep on reading for a more detailed overview of each network and our thoughts around the findings. Why is YouTube so engaging? YouTube, which processes over 3 million searches per month is the second largest search engine trumped only by Google. It’s bigger than Yahoo, Bing, AOL, and Ask.com all added up together. 58% engagement ratio on a video is incredible and helps illustrate just how powerful YouTube is. As a society, we are more likely to watch a visually stimulating video on a topic rather than read about it. 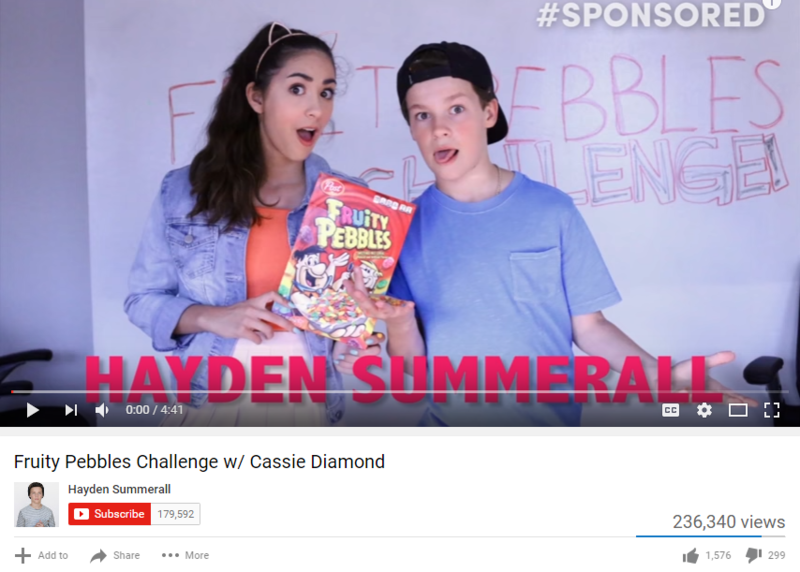 But unlike Facebook, Twitter or other platforms, the industry standard for engagement on YouTube includes views on the video as well as thumbs up and comments. Video views are the most important part of YouTube’s engagement and rightfully so since anyone reading this can all relate to getting sucked into a YouTube hole :). The other networks do track impressions and views but their API’s don’t allow access to that data the same way YouTube does. One of the surprises in our study is how engaging Facebook Personal Profiles are, 5.15% Engagement Ratio. After digging into the psychology of it the reason made more sense. People are much more likely to interact with posts created by people they have a close personal relationship with, as a result Facebook Personal Profiles have the second largest ratio. Personal Facebook Profiles is a great example of how micro-influencers can work wonders for brands. Often with a small following, micro-influencers usually have a more dedicated audience that tends to engage their posts more (family and friends). 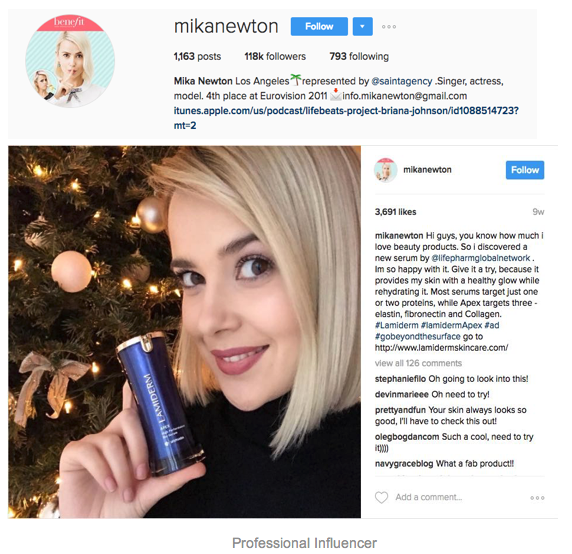 Since most micro-influencers charge very little or nothing for their services. A brand can leverage a lot of them to spread a wide net of social buzz. A picture is worth a thousand words and Instagram exemplifies this. With simple filters to make any picture look interesting and professional. Lots of Instagramers have cracked the code on what makes the perfect picture and brings engagement. As an added bonus, brands love the great pictures they can repurpose on their own social channels and capture customer’s attention. 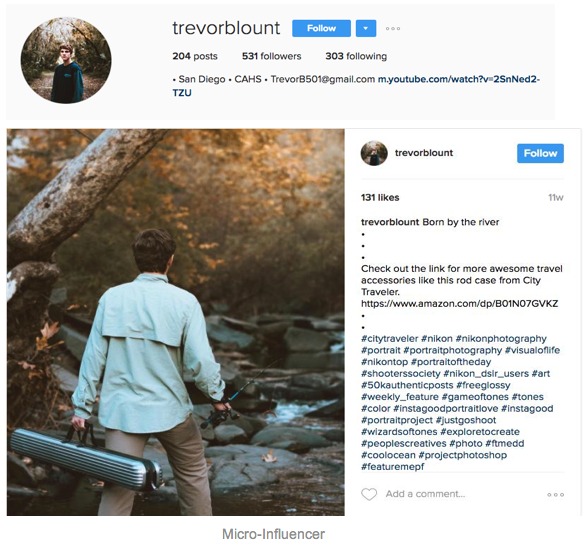 With an average engagement of 604, professional and micro-influencers are driving real social interactions. 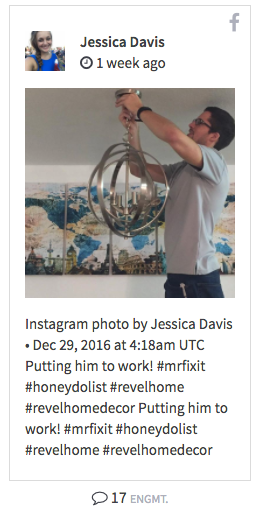 Just like Facebook Personal Profiles, micro-influences on Instagram are creating multiple pictures for branding repurposing with solid engagement numbers. Large professional influencers are also driving engagement with niche specific pictures that get their follower’s attention no matter what language they speak. You may be surprised to find out that, when it comes to engagement Twitter’s numbers aren’t as high as we might suspect. While the average following for twitter is near 18,000, average engagement around 10 per post. Does that mean you don’t want to include Twitter in your influencer marketing campaigns? Not necessarily. Twitter has character limits that have turned the network into a quick-paced information provider. Users often consume lots of information at a very fast rate and don’t always engage with tweets. Engagement reports are only counting interactions between users and tweets. These tweets still provide exposure and help with brand recognition. Facebook Pages have the largest average following across the social networks with over 48,000 total. Despite that, the average engagement is at 11 per post. This makes Facebook pages a great way to reach out to a large audience, but typically isn’t very engaging. Why? As stated before, Facebook was built around personal relationship and creating social connections. People don’t “usually” utilize Facebook to learn about businesses, they use it to get updates on their friends and families. YouTube – you’ll typically hire fewer influencers who produce high-quality content for a higher price tag, but with the best engagement. Instagram – you’ll find influencers with high reach, good engagement, more affordable compared to YouTubers, and original photos you’ll want to reuse. Facebook Personal Profiles – you’ll typically hire larger quantities of influencer’s at a lower price and expect a higher engagement ratio per post. With all of this said, please know that you can find great influencers on any social network. That’s why it’s very useful to have a tool like Tomoson.com, which allows you to filter by engagement and target influencers on the most popular social networks. 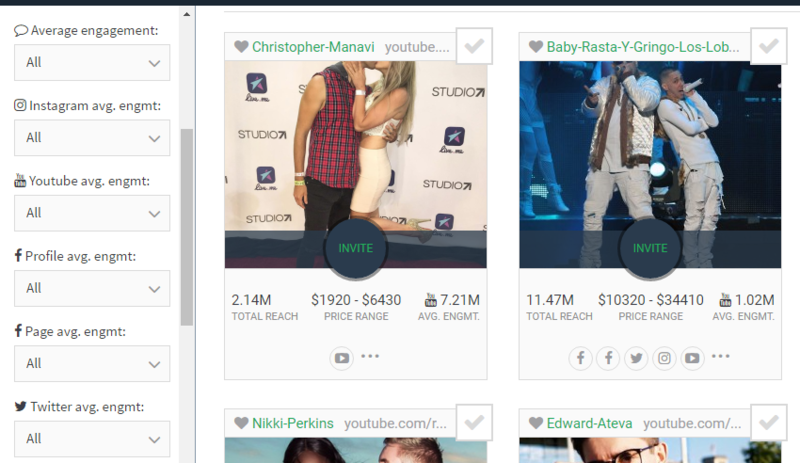 Tomoson has a variety of filters to help brands find the perfect influencers for their campaign. Brands can browse through a database of over 70,000 influencers by keyword tags, average engagement per social network, and other demographics.